With his contract coming due at the end of the month, Peter King flirted with leaving Sports Illustrated, his writing home since 1989. But King, one of the best known NFL reporters in America, decided to stay put. On Tuesday, Time Inc.'s Sports Illustrated Group will formally announce a multi-year extension of his contract. 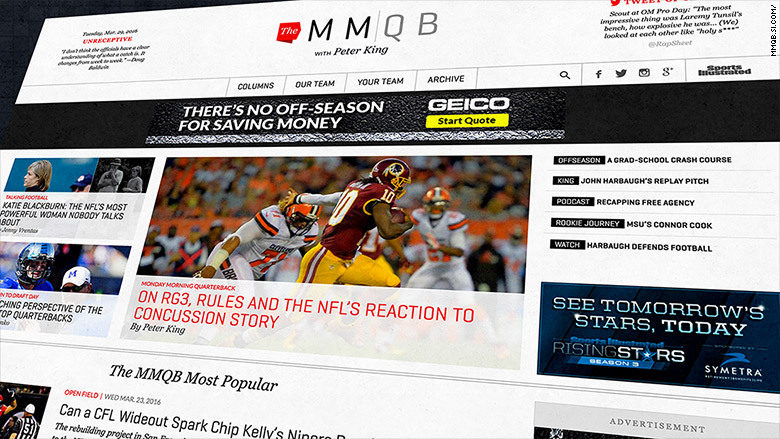 King will continue to write his Monday Morning Quarterback column and lead The MMQB, the web site he launched with SI in 2013. King, who has publicly speculated about a job shift before, said he "thought seriously about it" this time around. He mused about joining NBC full time (he appears on the network's Sunday night football coverage) and even about leaving the football beat to cover an election. But ultimately, he said in an interview with CNNMoney, "I am so bullish on the future of an independent site covering football with room to grow. And the backing of Time Inc. (TIME) was really important, because the company has committed to expanding The MMQB with quality hires. That was significant." The site currently has four writers, three full-time editors and a videographer, along with King. He anticipates adding a video host, a writer and possibly another editor in the months to come. "We're going to expand video and new media coverage of the game," he said. Additionally, "We may cover college football." King, 58, indicated that developing talent will be a priority: He sees his role being "a little more in the leadership and editing vein, because I'm not going to do this forever." "I do not know where the coverage of football is headed. I want us to be first and fresh and different and cogent, and our bosses are letting us do that," King said. "The future is a blur, but it's an exciting blur." He also said he'd like to be a "beacon for other similar media efforts at Time Inc. Specialized sites with strong staffs could work elsewhere around the company I believe."